Home » Films » Top 10 Most Iconic Star Wars Characters of All Time! Back to 1977, the very first Star Wars movie made its appearance, and later on, continued with 2 sequels The Empire Strikes Back in 1980 and Return of the Jedi in 1983. And what do you know? The Star Wars trilogy, especially the original Star Wars, was a huge phenomenon at the time it released. Even now, it still has significant influences in entertainment industry. Of course, Star Wars franchise hasn’t ended after the original trilogy yet, especially when Star Wars the Last Jedi going to be on air on December this year. Yet, there is still one month left before we can enjoy this new Star Wars sequel. So, what should we do while waiting for it? Well, why not visit our old favorite Star Wars characters? So with no further ado, let’s check out the Top 10 Most Iconic Star Wars Characters of All Time! Every hero always has a sidekick… or at least most heroes. And who can become a better sidekick than the furball fellow Chewbacca? It is said that Chewbacca’s creation was based on George Lucas’s dog named Indiana. Probably this is the reason why Chewbacca felt so emotionally close to our heart. Chewbacca is Han Solo’s sidekick and he is exceptionally good at that. 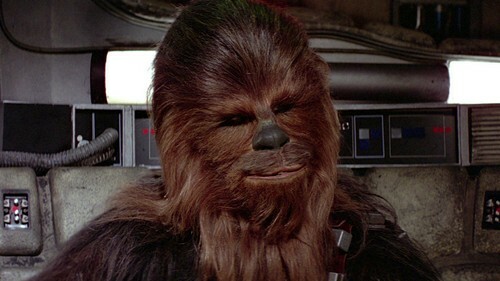 Chewbacca is versatile in almost everything, from shooting crossbow, driving to other mechanic works. But what made Chewbacca so famous are his high devotion and sweet nature. He is extremely loyal to Han Solo. Everyone who has watched The Empire Strikes Back would not forget the moment he cried out of pain when seeing Han Solo put into the carbonite. Another interesting thing about Chewbacca is his sound. Basically he can’t speak English, his voice and sound are so… unique which is like combination of bears, lions, and walruses? But nonetheless, we audiences can still understand his emotion and what he’s trying to say. It feels really special when we humankind can communicate with such other sentient being like Chewie and sense the emotional attachment with him. Indiana, the dog inspired Chewbacca character, is a big, hairy Alaskan malamute which likes to take passenger seat. According to Lucas, his appearance often makes people mistake as a human. Peter Mayhew starred Chewbacca mainly because of his impressive height of 7 feet 3 inches. At the end of Star Wars A New Hope, Luke Skywalker and Han Solo got medals of valor, while Chewie didn’t receive any. To no surprise, fans got really, really angry because of this (for an obviously good reason). And so instead, Chewie was given a Lifetime Achievement Award at the MTV Movie Awards 1997. The original Star Wars trilogy aimed at depicting 2 pure sides: Good and Evil. And of course, to depict true Evil, we need villains who share the true level of wickedness. Thankfully, that’s why we also have Darth Maul. Darth Maul isn’t simply an assassin, he is an extremely dangerous killers trained by Darth Sidious who slew numerous Jedi and other brave warriors. What impressed fans the most was probably the moment he pulled out the double-blade lightsaber. His final battle with Obi-Wan Kenobi was definitely epic despite his “loss”, yet he still managed to comeback and as powerful and wicked as ever. Besides his tremendous combat prowess, he is also a sinister schemer (taken from his time training with his master Darth Sidious). He also likes messing up with people’s mind, especially his sinister whisper about Qui-Gon Jinn before fighting Obi-Wan. Overall, Darth Maul is indeed a symbol of Evil. And his appearance alone is enough to give out a sinister aura of a true wicked nightmare. 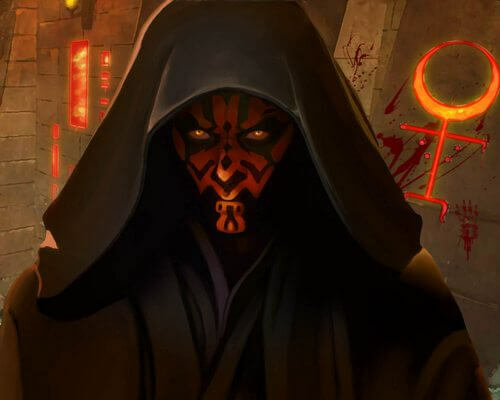 It required 2 actors to play Darth Maul: Ray Park in charge of performing combat and physicality for Darth Maul, and Peter Serafinowicz for Darth Maul’s voice. Originally, Darth Sidious intended to choose Mother Talzin as his apprentice. However, he felt interested in her son instead, thus abducting this boy who is later known as Darth Maul. At the end of The Phantom Menace, Darth Maul was defeated by Obi-Wan Kenobi. At first fans thought that was the end of Darth Maul, yet surprisingly, he was saved by his brother Savage Opress and returned a decade later. Darth Sidious personally punished Darth Maul in Mandalore. He killed Savage and made Darth Maul begging for his life. “Unfortunately”, Darth Sidious spared him and said he was still of use. 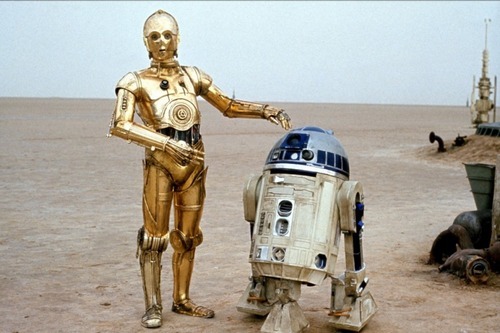 When talking about sidekick, we have to also mention our favorite robot duo: C-3PO and R2-D2. Though originally we often C-3PO in lower rank than R2-D2. But since these guys are often seen hanging around with each other. It would be unfair if we just talk about R2-D2 only, isn’t it? C-3PO is a gold robot which was created by Anakin Skywalker for etiquette and protocol purposes. He is fluent in more than 7 million forms of communication. However, that’s not what we like about this yellow fella (though knowing 7 million forms of communication is impressive indeed). What we like about the guy are his liveliness, his “pessimistic” comment (remember the quote: “We’re doomed! We’ll all be destroyed for sure“? ), and most of all, his funny nature. C-3PO may not look reliable, but he is definitely a welcoming fellow in a party. Besides C-3PO, we have R2-D2 – an iconic robot which is widely considered as “true hero” of the series. Not only R2-D2 is smart and loyal, he also saved our main heroes Luke, Han Solo, Leia, and Chewie. Some even argue that the entire “A New Hope” thing would not come true if he didn’t save Padme. Unfortunately, our bleep-bloop friend didn’t get much recognition as hero. But let’s be frank, he is definitely a hero of the entire series. There are C-3PO and R2-D2 Easter Eggs in Indiana Jones and Raiders of the Lost Ark and also the 2 Star Trek films by JJ Abrams. C-3PO’s actor, Anthony Daniels, was pretty mad about the C-3PO In 1983, He answered to People magazine that: “I really would have liked to smash the costume up with a sledgehammer.” Fortunately for him, he got a new $300,000 lightweight costume for the Return of the Jedi. Anthony Daniels is also the only one who appeared all 7 Star Wars films, including The Clone Wars. Up to this point, R2-D2 has appeared in all Star Wars films, from the original trilogy, the animated Clone Wars movie in 2008, to the Clone Wars TV series in 2008, and the Rebels TV series in 2014. Despite R2-D2’s inability to fly, he actually flew in prequel films (which somehow disturbed certain fanbase). The given explanation is that he is originally able to fly via rocket booster. However, this booster was not able to be fixed when damaged since the company behind it was dead. For those who have only watched the original 1977 Star War, Emperor Palpatine might just look like a “lame wizard” with full black robe. But turned out, he was the main evil mastermind behind most terrible events in Star Wars Universe. The more we dig in about him, the more interesting he becomes. If you think his intelligence and his scheming aren’t impressive enough, his dark power alone would be more than enough to convince you. 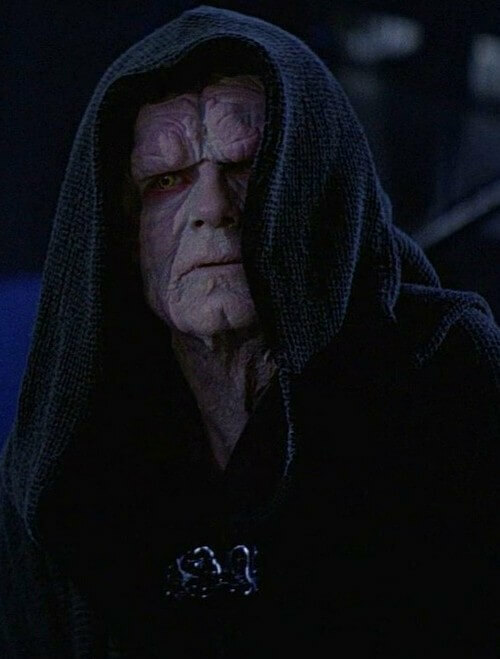 As we mentioned above, Darth Maul was an apprentice of Darth Sidious – Emperor Palpatine. When Darth Maul decided to betray him, the Emperor easily punished the traitor himself by killing Savage Opress and made Darth Maul begging for mercy. As you can see, even a powerful and youthful figure like Darth Maul and Savage Opress can’t defeat an “old man” like Palpatine. This pretty much tells us how powerful this sinister and creepy “old man” can be. Originally, Senetor Sheev Palpadine was not intended to be a Sith Lord. But, when George Lucas came up with idea of combining Anakin and Darth Vader (which we will talk later), he decided to make Palpadine a Sith Lord in a story about Palpadine rising in power. Lucas also intended to make Anakin Skywalker as Palpadine’s son the first place. Yet this idea was scrapped. When Emperor Palpadine wiped out the Jedi Order, he used the Jedi Temple as his palace. Also twisting enough, this Jedi Temple was built in order to seal the Dark Side beneath it. Unfortunately, Palpadine knew this and he manipulated this energy to shroud the Jedi’ vision. He was the one behind the creation of the Clone army, alongside with Count Dooku. He funded for the army creation, thus allowing him to use them for the Clone Wars. Emperor Palpadine also ordered to destroy his homeland Naboo via Operation: Cinder. This operation aimed to wipe out everything on Naboo to prevent the Rebels from taking it. Yet unfortunately for him this time, this plan failed. As the mentor of both Anakin Skywalker and his son, Luke Skywalker, Obi-Wan Kenobi is an insanely strong Jedi Master and also a beacon of light for Anakin and Luke. This figure represents every characteristic of a typical hero and mentor figure: patience, wise, and discipline. His achievements throughout his life are definitely not for show, including defeating Darth Maul, General Grievous, and even almost kill Darth Vader if not for his love towards his student. Ultimately, he sacrificed himself so that Luke could survive, which was later proven to be a fine decision. Overall, he is truly a great man despite his “failure” with Anakin Skywalker. But hey! On side note, we have to agree that he is good-looking man with awesome outfit. Defeating Darth Maul isn’t a simple achievement. If you haven’t already known, Obi-Wan was the first Jedi to defeat a Sith Lord (Darth Maul) after 1000 years. Obi-Wan Kenobi was an exceptional swordman of his own right, but that didn’t mean he used his sword all the time. On the contrary, he often seek ways to end conflict without spilling blood, hence the title “The Negotiator” throughout the galaxy. 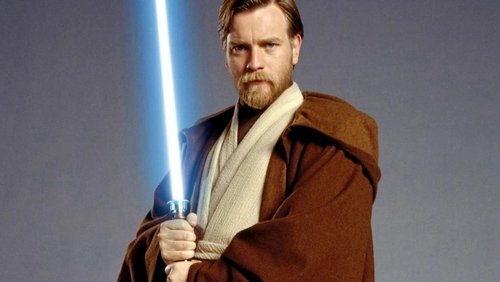 But before becoming a powerful and respected Jedi Master, Obi-Wan was almost not chosen as Padawan by any Jedi Master. He wasn’t accepted to be Padawan until an incident which trapped both him and his future master Qui Gon Jinn. The duo managed to escape and found out that they worked excellently as a team. Therefore, they became master and student. Obi-Wan had a pretty romantic affair with Duchess Satine. Sadly, this romantic story was ended when Darth Maul killed her for revenge. In Star Wars The Force Awaken, Obi-Wan’s voice echoed when Rey touched Anakin’s old lightsaber. Luke Skywalker was the hero of Star Wars A New Hope and also Rey’s mentor in The Force Awaken. During the original trilogy, he didn’t seem to receive as much love from fans as other characters. This was mainly because of his characteristics during his young ages. Luke Skywalker is a courage young man, yet reckless and even cocky. But that was only nearly half of the story. Understanding Luke Skywalker is like understanding the process of a man’s life, from a cocky teenager (original Star Wars trilogy) to a seasoned and calm Jedi Master (The Force Awaken). Watching Luke might feel irritating at first, yet watching his whole life will be much more interesting as we can see his character development throughout the series. That is probably the reason why we hate Luke, but also love him at the same time. 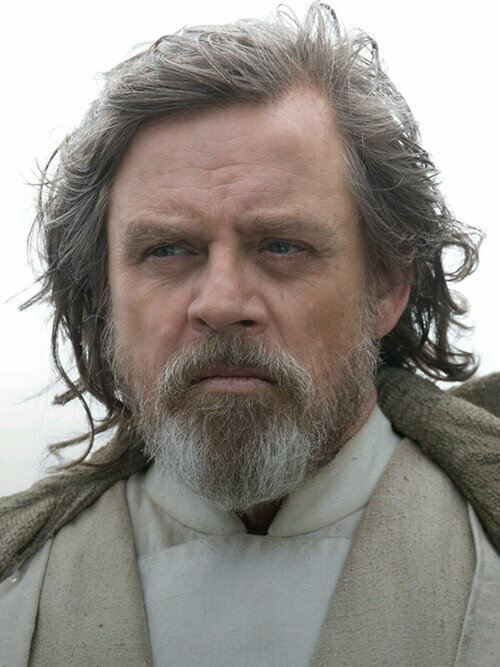 By the way, it is also interesting to see Luke’s actor, Mark Hamill taking the role of Luke during his younger ages to his current days. Initially Luke Skywalker’s name was intended to be Anakin Starkiller. But then his name changed to Luke since the name “Starkiller” would be too violent and not suitable to be a hero’s name. Normally a Padawan will be taught by a Jedi Master to understand the way of the Force. But in Luke’s case, he had to train on his own for 3 years after the death of his mentor Obi-Wan Kenobi. Before the original Star Wars trilogy was formed, Luke’s age was unknown until Revenge of the Sith. Based on the established timeline, Luke was 19 at the beginning of A New Hope, 22 in The Empire Strikes Back, 23 in Return of the Jedi, and 53 in The Force Awakens. Mark Hamill was known for his role of Luke Skywalker. But do you know that he was the one behind Joker’s voice in many games and cartoons? Also just recently, there is a delicious meta event in Justice League Action’s new short in Cartoon Network. In this new short, Mark Hamill was captured by his Joker – the character he did voice acting. Now that’s quite ironic! 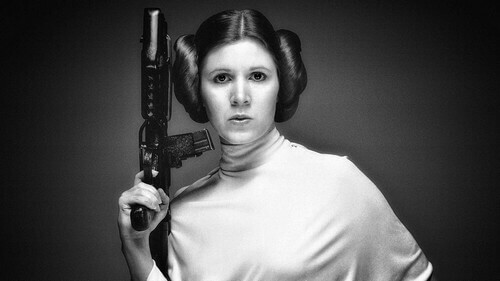 Let say if we have a list of top 10 female characters in movie industry, Princess Leia will definitely be on this list. Before the first Star Wars in 1977, we often have “damsel-in-distress” type of woman figure in most films. And when Star Wars came along, Princess Leia made a huge blast in society. Why’s that? In short, Princess Leia was the symbol of woman power. Unlike our traditional woman role, Princess Leia is a brave general, politician, and an influential rebel. Even in disadvantageous situation, she still stood her ground against Darth Vader, making her one of the most iconic woman figure ever. Of course she was once stuck in the “metal-bikini slave” controversial (thanks a lot Jabba), but later on she still got her vengeance on Jabba the Hutt. Again, do not fool around with Leia Organa; she is not a simple woman to be messing with . Princess Leia has always been known to be Force sensitive, yet she didn’t show any significant of Force users like other characters. However in Marvel Comics, she has certain abilities such as sensing the past events in the present area. Funny enough, a reddit user found out that Leia Organa had the highest hit rate of 66%, while our favorite cowboy Han Solo’s was only 57%. That said, Han Solo clearly shot the most. The “metal-bikini” slave was a pretty controversial part about Princess Leia. Many fans also wore this costume as dedication for their favorite character. But nonetheless, she still maintains her status and she showed that she wasn’t slave to be toyed with. If you messed with her, she would return what you deserve. Star Wars fans would not forget this famous quote from Leia: “Help me, Obi-Wan Kenobi, you’re my only hope.” Ironically, she never met Obi-Wan By the time she and her comrades returned to the Millennium Falcon, Obi-Wan had already fought with Darth Vader. 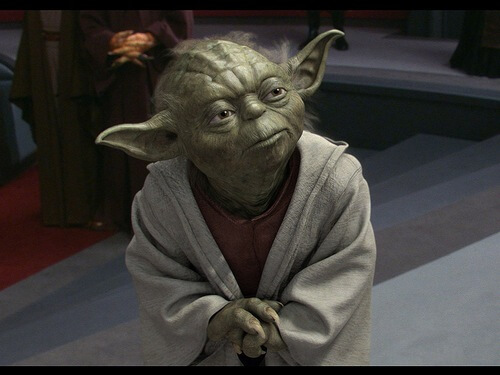 “May the Force be with you.” This quote is popular among Jedi, yet it seems to be most famous with Master Yoda. Yoda isn’t simply an old, short? (well, at least compares to human’s standard), green-skin goblin-like being. He is probably the most powerful Jedi ever lived and also a great mentor. He first appeared in The Empire Strikes Back as Luke’s trainer and he surely gave Luke quite a hard time discovering things on his own (given Yoda’s sound, it’s probably better that way?). That said; no doubt Yoda is a wise man and he taught Luke (including we viewers too) many things about life. And of course, watching the bond between Luke and Master Yoda is definitely heart-warming indeed. Yoda’s first name is left unknown intentionally since Lucas believed it would make him feels more mysterious. Despite being Yoda’s puppeteer, Frank Oz wasn’t accepted by Lucas to be voice actor for Yoda. Lucas even made an audition for Yoda’s voice actor, but eventually he gave that role to Frank Oz. Stuart Freeborn, the one behind Yoda puppet creation, designed this character based on his own facial appearance. And to make Yoda feels wise purely by looking; he added several Einstein’s traits to this character. Initially Yoda was meant to appear in The Empire Strikes Back However, in order to convince viewers that Luke’s father is Darth Vader, Yoda was added to fulfill that persuasion role by confirming to Luke that “he is your father”. Yoda’s reputation as a Jedi trainer doesn’t limit to Luke He also trained many other Jedi such as Kit Fisto, Mace Windu, Ki-Adi Mundi, and maybe even Obi-Wan. There is no surprise if we see Han Solo in every top Star Wars characters list (still he is number 2 and most of us probably know who is the number 1 by now). What can we say about Han Solo? He is one of the most beloved characters in Star Wars, even more than our hero Luke Skywalker. 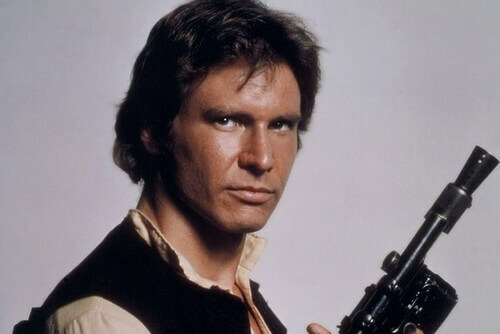 The thing is, Han Solo isn’t a simple smuggler, he is an awesome space cowboy with wits, skills, his charming smile, and an awesome spaceship. But again, what makes Han Solo most impactful towards viewers’ heart is his believability. Han Solo appeared as a believable man on screen. A relatable man with skills, yet still has flaws. His love story with Princess Leia and his path from a smuggler to a prominent Rebel member are also interesting to watch. Originally, Lucas designed Han Solo to be a huge green-skin alien. But when Lucas and Ford worked on the character, they decided that it would be better to leave Han Solo as human. Another thing about dialogue, In The Empire Strikes Back, when Leia said “I love you“, Ford ad-libbed his line “I know“. Guess Ford’s dialogue is supposed to be different. There was a hot debate about the typical Han Solo “vs” Greedo in Cantina. Mainly, people discussed about who shot first. According to the original Episode IV, clearly Han did the first shot. But in altered version by Lucas, Han dodged the first shot from Greedo. But nonetheless, it seems people sticks to the original version. It’s said that Harrison Ford didn’t take the role Han Solo At first, he simply hung around after American Graffiti and helped other actors reading their line. Interesting enough, Lucas took note of this and eventually he chose Ford. Well, finally we’ve come to the big boss himself: Darth Vader. Darth Vader, a.k.a Anakin Skywalker, is probably one of the most, if not the most, iconic bad guys in entertainment industry. Darth Vader is such an iconic figure that even people who haven’t seen a single Star Wars episode know him. Originally as Anakin Skywalker, he was trained under Obi-Wan Kenobi with hope that he was the Chosen One. Unfortunately, fate had another plan for him as Emperor Palpatine manipulated him and made Anakin as one of the most successful “students” Palpatine ever trained. 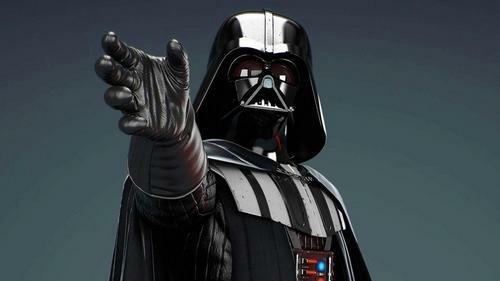 No doubt, Darth Vader is also one of the most influential Star Wars characters in history. We see his references everywhere and he also inspired many characters later. Say… isn’t Arthas’s story from Warcraft 3 similar to Darth Vader? Both are respected heroes of their prime time. Both lost something dear to them and desire vengeance. And of course, both became the significant villains of their respective Universes (Anakin – Darth Vader, Arthas – Lich King). Darth Vader’s iconic helmet was based on Japanese ancient war helmet, all thanks to influences of The Hidden Fortress by Akira Kurosawa. Anakin Skywalker is supposed to be the Chosen One to defeat the Sith Lord. When he turned to Dark Side, Yoda and Obi-Wan started to think they read the prophecy incorrectly. But in truth, Anakin was still the Chosen One since he personally threw Emperor Palpatine into Death Star’s reactor shaft. There are many actors took the role of Darth Vader in different occasions. For example: David Prowse wore the Darth Vader suit in the original Star Wars trilogy, while Sebastian Shaw appeared as the Vader’s face in Return of the Jedi.